Sometimes I get to spend a tiny but important fraction of my weekends with my coolest 7-year-old mates. Besides chatting about what they have done that week, we learn new words, read about sea creatures and play UNO together. Even now, I have yet to master the general principals of this favourite family game because Honey and Brittany are just too quick for my slow and poor reflexes. I remind them to pause at full stops and commas and be confident with subtractions, and they in return never fail to educate me on subjects that deal with reality and humanity. Their favourite colours, pink and purple, today make up some of my wardrobe items, and I am desperately trying to keep up with Disney’s new-age characters. Brittany and Honey are two lovely, well-mannered Myanmar kids who love to run, sing, dance, play, and their parents would do anything to provide them with an opportunity to attend school every day just like the rest of our kids do. Unfortunately, the chance for them to go to school is one we take for granted. Today, refugees are forced to leave their lands, risking all they have to cross international borders, just to be able to live another day. Today, we also see more and more displaced families from other parts of the world seeking protection. The resolution to this problem is clearly a complex one that requires negotiations between leaders that go beyond a pat and a cup of coffee, one which I have no answers for. Nelson Mandela once told us that education is the most powerful weapon we can use to change the world. He has my vote. Education is one of the driving factors that improve and alleviates poverty, it is a key that opens doors to the next step. In Malaysia, refugee children do not have the opportunity to attend regular schools, so they depend on volunteers and NGOs for support. Although well-connected, not all NGO groups are involved in negotiations to resolve the original conflicts. Regardless, they are instrumental in providing fellow volunteers with an opportunity to be part of the change Mandela speaks about, to educate and to be educated. 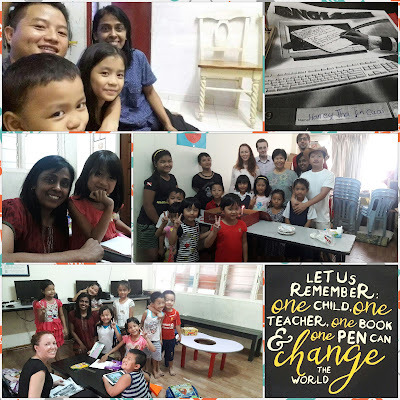 Social groups like Tutor a Refugee Child, Voice of Refugee led by Jessica, Mok, Rhoda, Peter, Remus and the rest of the volunteer crew are involved in amazing and incredible initiatives every day and every week. They work to provide opportunities for refugee children to learn and adapt and not to be left out. Whether one leads the change or offers a hand to be part of the change in whatever possible way, that's a treasure. I have provided the links below if you wish to know more or be involved. Malala Yousafzai, a teenager herself, is one who has matured beyond her age. Perhaps she too takes some coffee and reaches out to those stars for answers and for wisdom. Regardless, today she advocates for the rights of women's education. Her point is loud and bold when she says, let us remember one child, one teacher, one book and one pen can change the world. Pastor Sheila her husband Pastor Michael Wright along with Vanitha, Satia and Hema, work together with a crew of selfless members at NLCC. These members are also volunteers who have dedicated themselves to caring for the well-being and improving the quality of education, specifically in English and math, among the children of Kampung Muhibbah through their free weekly community programs. We have heard it over and over again, education is the key to reducing poverty, and organisations like theirs are doing something to make this difference. My friends and my first engagement with her was after we came across a heart-warming article in the ‘STAR’ on her relentless efforts to bring young children roaming in the streets during school hours together under a roof. She worked to provide for and school them every day so that they would not engage themselves in adverse actions. Corporate organisations such as DHL, Shell, CIMB, Microsoft, Giant through their CSR programs are also actively involved to make changes possible and have a positive impact on the lives of these little ones. Together their staff unite for a common cause - to reach out and provide an opportunity to those who need it. My coffee shot for today is one that is as special as my young mates. 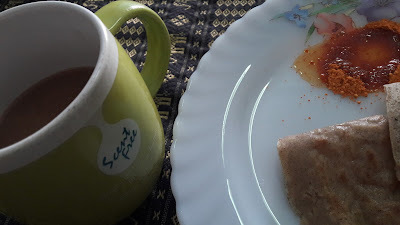 Its plain instant coffee served in the cup I use every day. Its ingredients are basic: palm sugar, Nescafe and creamer mixed together in boiling water. No frills, but this cuppa speaks the unspoken language of comfort. Now listen to the chirping of those tree-sparrows, time stands still. When my coffee looks back at me, it has no expectation, only a small hope that today will be a good day. Also, a hope for these little friends and theirs that they would get the right papers to live in a country that recognises their existence and to have the same opportunities as we do. A hope that someday they will take me to the place they once called home and show their grandma's house where they once played hide and seek. For them to be able to show me their schools and then take me on an adventure to taste some local coffee. Till then, together with our other volunteer friends, we will continue to read with you. Millions if not billions cups of coffee are drunken everyday but drinking a cup of coffee while engaging in improving refugee's life is not a job everybody can do. For sure the taste of humanity in your coffee made this post fantastic!